The digital cloud has spawned a seemingly endless supply of services. However, those services are created by companies looking for ways to profitably serve a large customer base or a niche group of people willing to pay a premium. However, some of the problems that people face don't fit the category of what businesses might see as a good opportunity, so the solution you seek either doesn't exist or is too expensive. Fortunately, with some creative thinking, you can often times take existing services and find ways to make them serve your needs. 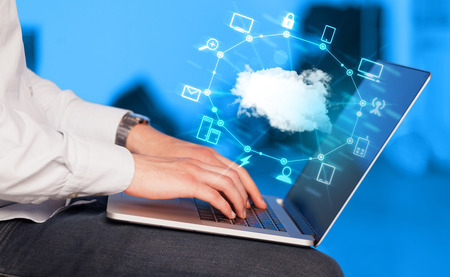 These five hacks will show you some unorthodox ways to get the most out of the cloud. QuickBooks Desktop is Intuit's non-cloud accounting software. While Intuit has been pushing its online, cloud-based version of QuickBooks lately, some accountants still prefer the Desktop version. Unfortunately, using the desktop version means you cannot remotely access your files. You can get around this limitation by using Dropbox. Create a folder called QuickBooks in Dropbox and move the company files created by QuickBooks (most importantly, the file with the extension .qbw) into that QuickBooks folder in Dropbox. When you open your QuickBooks desktop application, select "Open or restore company" from the file menu, and select the .qbw file for in your Dropbox QuickBooks folder. Now you, and anyone you give access to that QuickBooks folder, will be able to open and use your Desktop QuickBooks file. However, there is one significant limitation here. Dropbox doesn't use any kind of a checkout function, so there is no way for you to know, if someone else has the QuickBooks file open. If you open the QuickBooks file, while it is open on someone else's computer, Dropbox will create a "conflicting file," for each person's session. Futhermore, you aren't going to be alerted that this has happened, so you might not even realize it for some time. A conflicting file isn't the end of the world and the differences can be reconciled, but it is a pain. It's very important that you create some kind of system to make sure that only one person opens the QuickBooks file at a time. If you've ever had a complex medical situation, you know that at some point you will need to share your medical records with multiple doctors and specialists. Unfortunately, that's often easier said than done. Because of privacy laws governed by HIPAA, doctors' offices cannot email medical files - they have to be received in person, by mail or by fax. For many people, none of these options are convenient. Furthermore, each of these methods will result in your having a paper copy of the records, which is much less convenient for storing or sharing than a digital file. However, there is a trick you can use to easily get a digital copy of these files. Sign up for a free trial with an online fax service (here are some options) and have the doctor's office fax the records to the number given to you by your chosen service. That fax will be converted into a single digital file (typically a PDF) that you can save on your hard drive and do with as you please. Once you've received the records, you can cancel the free trial and pay nothing. If you feel like your office desktop is your "home base," and your other devices don't give you access to some critical files or software applications, fear not. TeamViewer is a tool that gives you remote access to your computer. TeamViewer was designed to help IT professionals service their clients, and its "Remote Control" feature allows you to remotely connect to a computer and use it from another location. The best part of this tool is that it works across platforms, so you can use a PC-only program on your desktop even if you're remotely accessing it with a Mac laptop, for example. The other best part of TeamViewer is that it's free for personal use. You can also use TeamViewer to access your desktop through an iPad or other tablet to access and use full Excel files, desktop QuickBooks information, or anything else you might need while out of the office. It's a fact of life that the lifespan of computers is pretty short. And when you find yourself investing in a new computer, it can mean spending a lot of time copying and moving files from the old one. In order to avoid that and save yourself some time, sign up for a document sharing service (here are some options) and move all your files into the designated folder for that service. For purposes of this example, we'll assume you've chosen Dropbox. If you simply select all the files exactly as they are on your computer and drag them into the Dropbox folder, they will maintain the exact same folder and file organization. When you get your new computer, all you'll need to do is download the Dropbox app and enter your login information. As soon as you have an Internet connection, all your folders and files will begin to load onto your new computer. If you don't want to keep paying for the Dropbox account, once your files are downloaded, move all the files back out of the Dropbox folder then delete the app and terminate your Dropbox account. If you find that a high percentage of your computer's hard drive space is consumed by pictures and movies, you can reclaim that space while still maintaining easy access to the files at home by using an external hard drive with your home router. For this purpose, a 1TB to 3TB external hard drive will work well and will probably be in the $80 to $120 range (here is Amazon's External Hard Drive category). You can save a lot of time by first plugging the drive directly into the computer that has the pictures and movies you want to move. Copy those files directly to the external drive. Once you've opened several of the files on the hard drive to make sure they copied safely, delete them from your computer and empty your trash to clear out the hard drive space on your computer. Now, plug the external drive into your home router using a USB plug (the vast majority of routers have a USB port), and use the instructions that came with your router to access the newly connected drive. You will now be able to access those files from any computer on your home network. If you have any questions about any of these hacks or would like to share some of you own, please share them in the comments!